It’s a year since we launched the new edition of the Essential Trustee (CC3) and kicked off a campaign to get every trustee to read it. And I wanted to share some reflections on this campaign and our results so far. Why do we think this piece of guidance matters so much? And where do we go next? Our task was to get across the message that being a trustee is a serious responsibility, but it doesn’t have to be daunting if you are armed with the right knowledge and understand your duties. We made the language we use clearer, and we updated our explanation of trustee responsibilities and what the regulator expects to make this guidance easier to understand and apply. We publish over 40 pieces of guidance on our website to help trustees understand their responsibilities, be more effective and ensure their charities deliver their aims. It’s preventative – if you know what you should do there’s less chance that we’ll ever need to intervene with your charity and more chance that you’ll be operating effectively. Some of the guidance we write is quite broad and should be read widely, other pieces are much more specialist and will only be needed by a limited number of trustees. However, if you only read one piece of our guidance, we want you to make it The Essential Trustee. 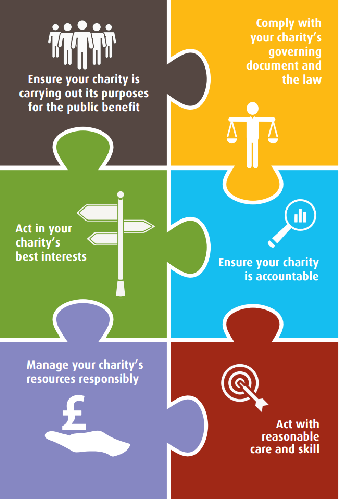 We want every charity trustee to know the six key duties set out in the Essential Trustee and understand how to fulfil them. These are all examples of how trustees should be putting their duties into practice. So how has our campaign promoting the Essential Trustee gone so far? In our first year, there were 158,300 clicks on the Essential Trustee main page; 114,173 people viewed it. That’s roughly twice as many people as the year before. We promoted Essential Trustee through digital media, conferences and seminars, blogs and articles, and directly through our casework and contacts with trustees. Twitter proved a great way of increasing our reach. For example, the jigsaw infographic (left) has proved extremely popular, with over 7,000 hits since it was published in May and lots of charities and umbrella bodies using it at events and in presentations. And we have launched a new video too. But there is clearly still a long way to go. Registered charities in England and Wales have over 950,000 trustees. We would like to see all of them using the Essential Trustee. We can’t achieve this alone and are working with a number of charities and professional advisors to spread the word. We will continue to promote CC3 as part of our work on raising standards of trusteeship and governance. This work also includes contributing to wider initiatives in the sector such as taking part in Trustees’ Week and supporting the revision of the Governance Code. We also want to build our capacity to contact more trustees directly, by increasing the number of trustees who sign up for our email (by sharing your email via logging in here; or online without logging in here) and twitter alerts. When we launched this campaign year ago the intention was to encourage as wide a readership as possible. Events of the past year have made this even more important. Trustees who understand their duties and put them into practice are at the heart of what drives trust and confidence. As Sarah Atkinson's blog explains, public expectations are actually quite simple. Charities should makes a positive difference to their cause. A reasonable proportion of donations should reach that cause. Charities should be well managed. Fundraising should reflect their values. And trustees should make independent decisions that further their cause. So if you haven’t done so already, read up on your duties. And if you have, encourage your co-trustees to do so as well. Why not share our infographic, or play our video at your next meeting? The CC3 Essential Trustee Guide is very vague when it comes to Governance situations. It appears to believe that the ideal situation of a well run co-operative board of trustees exists. "xxxxxxx charity case" shows that the reality is different with a clique of trustees rubber - stamping whatever the Chair of Trustees (who brooked no argument from anyone) decided and out - of - control CEO wanted! I wish that the Charity Commission produced "real" help guides for real situations. Maybe then people would read these missives and impliment the suggested solutions! Thank you for your comment which I will be passing on to the CC3 writers. On the dominance and decision-making issue which, as you point out, comes up quite a bit when working with charities, you might find this piece of guidance helpful: https://www.gov.uk/government/publications/its-your-decision-charity-trustees-and-decision-making. I have read with interest your link and the item in question. However you appear to presume that you are dealing with "reasonable people." As in the case of motor car drivers supposedly reasonable people become totally out of control when a little power goes to their head. Maybe in your next CC3 edition you should include a section entitled "What to do when you are dealing with an unreasonable Chair or subservient committee - when all reasonable arguments fail! What do you do when you are sent to coventry for having the temerity to ask searching questions! There are too many people who are basically bullies and use their power as chair to force through actions that should never have seen the light of day and are bad for a charity in the short or long term. I should like to know how many trustees have you disbarred from acting as a charity trustee since the Charities Act 2011? http://www.smallcharities.org.uk/fileadmin/user/files_documents/CodesofConductforTrustees-CTNbooklet.pdf Another resource that I think is really useful is this: https://www.gov.uk/government/publications/charity-trustee-meetings-15-questions-you-should-ask which might help set expectations about what meetings are for. The Charity Commission does not have the power to disqualify trustees yet, but we will do from October this year (the new Charities' Act). However, we have removed trustees from charities, which disqualifies them from acting as trustees, and you can get the stats for every year in the Tackling Abuse reports we publish. The link to the last one is here: https://www.gov.uk/government/publications/tackling-abuse-and-mismanagement-2014-15. Let's all be realists. This is a General guide... And, there is something in there for everyone. Well done on a well written document and to all those picking fault, grow up! Can you please give some guidance on the appointment of new trustees. Assuming the relevant Deed gives the existing trustees necessary powers in this area, can Charity Commission advise whether, in addition to those necessary qualifications set out in the CC general guide, whether there are any requirements on (a) citizenship, that is, whether or not non British nationals may become trustees and (b) any domiciled or residential requirements, that is must trustees be normally domiciled or ordinarily resident in the UK (or England and Wales, for a trust formed under that law). I agree with Jonathan Grosskopf. There are some appalling "trustees" out there, some of whom lack basic trustee skills and can be manipulated by a devious Chair of trustees (especially if the Chair suffers from "founder syndrome" and thinks their job is to run the charity. It is not). The charity sector suffers from low standards of governance. The badly-run charities (a minority) are giving the good ones (a majority) a bad name. The Commission needs more regulatory teeth. Public confidence in charities has been falling for years and the recent media reports of scandals only make things worse. Belatedly - the document is 40 pages long,heavy on the manager speak and only available online. Our village hall has trustees without internet access,and most are over 70 and have no experience or interest in modern organisation speak. That is why it goes unread. As will this, I fear.